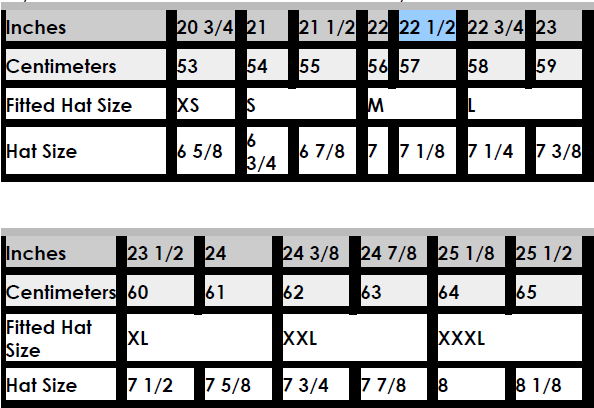 Now use the chart of hat sizes below to determine your size. If your head size falls in between two sizes, you should choose the next larger size. For example, if your head measurement came out to be 22 1/4 inches, you would move up to the 22 1/2 column (the blue one above). Following it down, you would find you are a size M (Medium), or a 7 1/8 hat size. Flexfit hats have a range of sizes, such as S/M (Small through Medium). 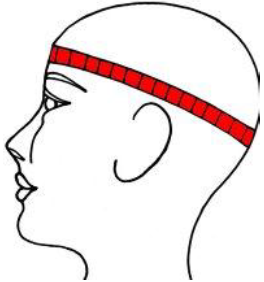 So a S/M hat would fit heads with measurements of 21 inches to 22 1/2 inches, or hat sizes 6 3/4 to 7 1/8. A L/XL (Large through Extra Large) hat would fit measurements just over 22 1/2 up to 24 inches, or hat size 7 1/4 to 7 5/8. If a hat does not list sizes, it is a 'one-size-fits-most' hat. It will fit sizes from hat size 6 3/4 up to 7 5/8.